While website upgrades often involve an alchemy of best guesses, gut instinct and sheer faith, the latest round of web analytics software is enabling systems contractors to precisely measure the impact their web design changes are having on site visits-and most importantly, site revenue. 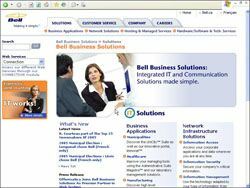 Bell Business Solutions, which specializes in integrating IT and communications solutions, also includes web analytics among its service offerings. Plus, a number of data networking systems integrators are offering web analytics solutions as part of their core service offerings. These include Softmart, an installer/integrator of IT data networking and related software and hardware systems featuring WebTrends; Bell Business Solutions which specializes in integrating IT and communications solutions; KodeNet, an installer and manager of data networks; and Miratek, another data networking systems integrator. The spate of all the new web analytics software releases being used and recommended by systems integrators is especially timely, given the release of a new survey from the London Business School, which found that 83 percent of the FTSE 100 interviewed believe that creating a positive online experience is "very important." The survey also found that 78 percent of those interviewed planned to devote more attention to creating a positive online experience. Softmart, a data networking systems integrator, offers web analytics as a core service offering. The program uses a graphical overlay format to display the information, which literally includes the dollar-and-cents value of every link on every page, along with more traditional analytics metrics, such as the average amount of time visitors spend on each page, the average number of clicks visitors make on the page, and the total number of visits that are made to any given page during any given time period. Meanwhile, other packages, including SalesGenius from Genius, ContentLogic 2.0 from InfoSearch Media, and LiveStats from Deepmetrix, offer marketers and designers the ability to see the impact of changes they've made to a site in real time-rather than being forced to wait for a report from IT that might take days or even weeks to arrive. Still other packages, like HBX Analytics 3.5 from WebsideStory, allow marketers and designers to take a hard look at the streaming audio and video media they're using at their sites, and precisely determine if such media is actually being viewed, and is paying off. This latest incarnation of HBX Analytics also offers a new window on user behavior marketers and site designers have long sought on the impact a website upgrade has on mobile device users. Moreover, in a nod to the growing influence of what has been dubbed "consumer-generated media" or the wave of consumer commentary showing up in blogs, social networking sites like MySpace, mailing lists, and bulletin boards-a number of web analytics firms are retooling their packages to help marketers leverage "CGM" input to build better websites. In addition, marketers looking to see how website marketing stacks up against other formats, such as e-mail marketing or more traditional marketing forms like print and telemarketing can also turn to packages like SaleGenius for a cross-platform marketing analysis. 1. Google Analytics: "Google Analytics became available late last year and quickly became the hottest thing on the internet," according to Jasra. 2. StatCounter: "Although it has fewer bells and whistles than Google Analytics, it still provides a simple interface with useful reports," Jasra said. One of the package's strongest components is the detailed analysis it provides of each path a visitor takes through a website. 3. ClickTracks Appetizer: A stripped-down version of ClickTracks' commercial web analytics program, Appetizer offers reports that groups visitors by how they behave on a site, analysis of web-based marketing campaigns, and detail on how many web offers result in actual sales, Jasra said.